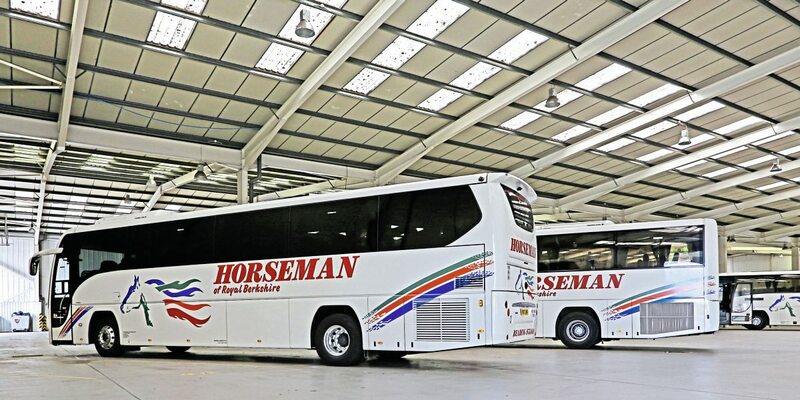 Were it not for the unmistakable flying horse logo on the tower, it would be easy to mistake Horseman Coaches’ Reading depot for a factory or warehouse. 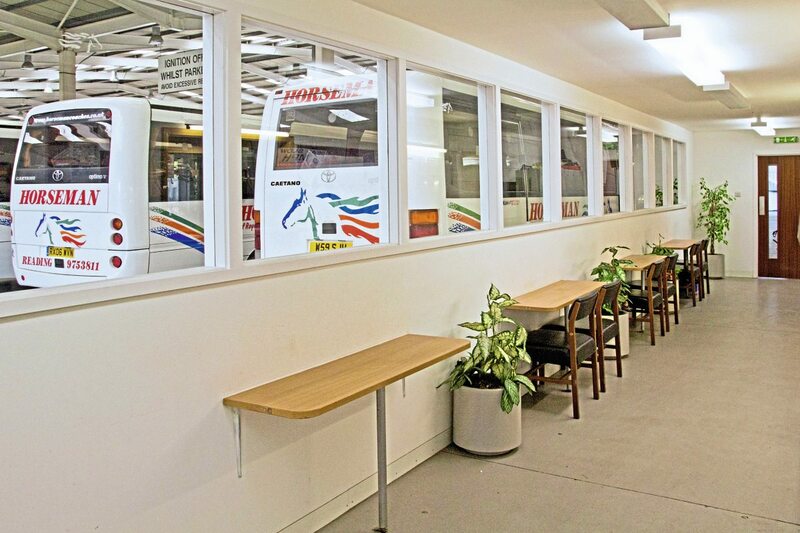 With 6000m3 (65,000 square feet) of covered space and an extensive glass-fronted administration block, the depot occupied from 2008 enables almost all activities and vehicle parking to be under cover. The depot therefore plays an important role in delivering the high quality of service that forms part of the company’s ethos; ‘this is how it should be done.’ Targets are set high, not just to continue as a dominant name for quality in the Berkshire area but to raise the bar higher to benefit customers and the environment. The flying horse logo has represented the company’s brand with little change for many years but remains fresh and crisp in conveying the quality message to consumers. Although growing up with coaches, James did not join the business in 2002, initially working in operations and learning the business alongside his father, Keith, who founded the business in 1977. He had studied fine art at college and subsequently followed his vocation as a professional golfer on the PGA Euro Pro Tour circuit. He still enjoys golf! Since 2011, he has taken on increasing responsibility for the business. His father still has an active role in the business but James’ leading position mapping out the business’ strategy has recently been reinforced by the appointment of a General Manager for the day-to-day running of the business. Having previously been the company’s Operations Manager, David Elliot has stepped up to the new role. 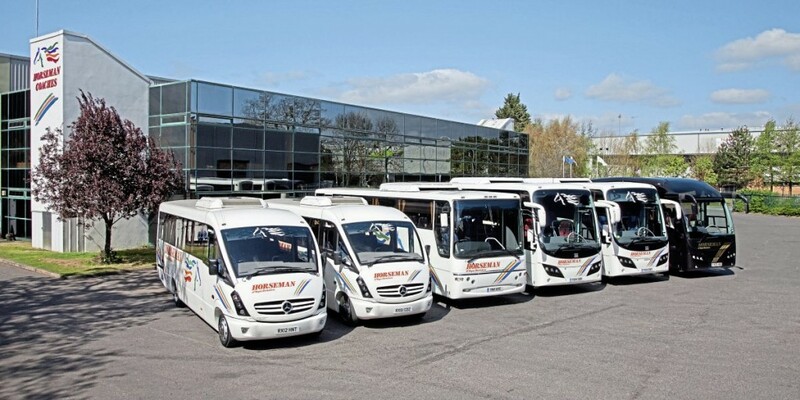 Of all the company’s activities, it is in the provision of vehicles for the tour market that it has seen considerable growth in recent years. James says this has been driven by the company’s continuous focus on quality: “We made connection with a couple of tour organisers and they used our vehicles in our colours. School work remains at the core of the business and is operated in various forms; home-to-school closed contracts for private schools, local authority contracts, parent-organised services, school contracted services and private hire. 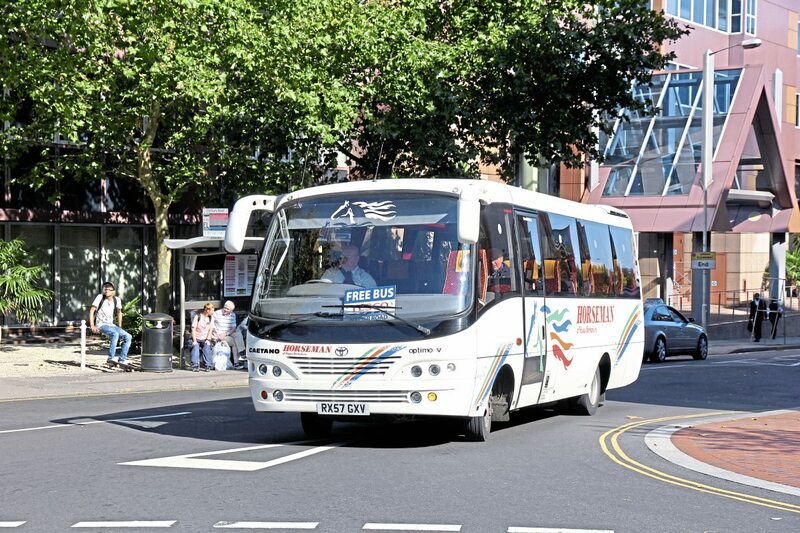 There are also several registered bus services serving the more remote parts of Reading. Most school operations, varying in capacity from 19 to 70 seats, are covered by a regular driver. Due to catchments areas and proximity to schools, many vehicles in the fleet incur relatively low mileage each day, which, coupled with regular quality maintenance, makes the company’s vehicles popular in the pre-owned market. 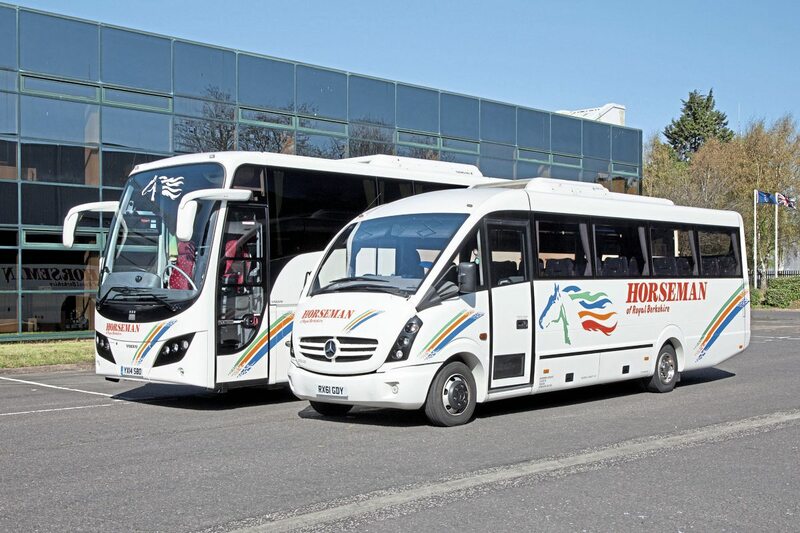 Another important area of work, at which the recently-acquired Unvi Sprinters are particularly aimed, is the provision of corporate shuttles for some of the multi-national concerns that have established themselves in the Thames Valley in recent years. 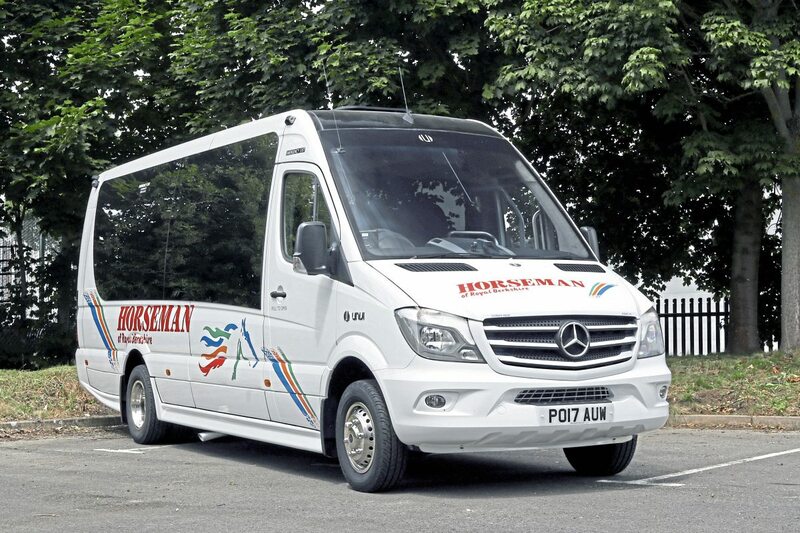 Unlike many operators, Horseman Coaches is positive in regard to attracting the right staff. The company’s image means drivers are keen to approach the company for employment and, with a good retention rate, there is now a waiting list for vacancies. The only area where the company has found the need to formally recruit in recent years has been for office staff. James put this down to the company’s approach to its staff: “They see the company investing over £1m in the fleet every year as well as upgrading our working environment alongside offering them the hours they need to work and at a good rate. We are also flexible in terms of time off, understanding that they have lives outside of work. It is about striking the right work-life balance. 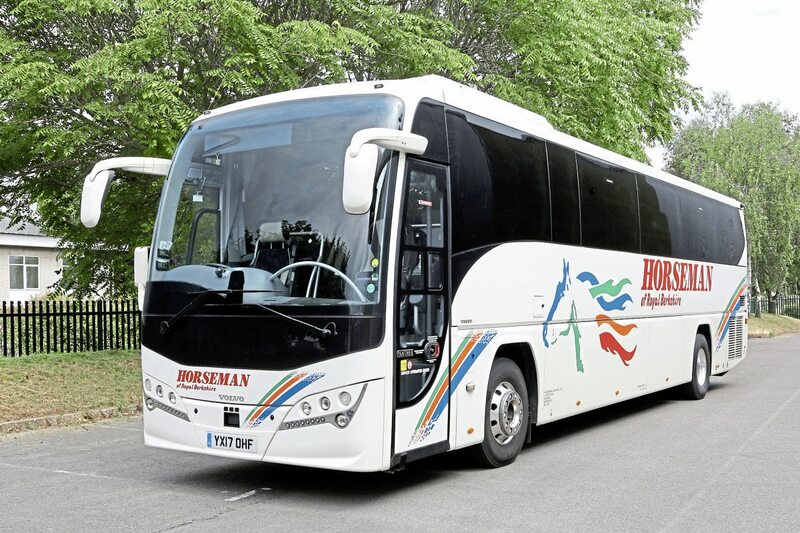 Horseman Coaches currently engages 88 staff across driving, office and engineering roles. Drivers are provided with uniforms from Uniform Express and training for their CPC is provided in blocks to meet the five-year deadlines, the initial phase having been delivered shortly before the deadline. 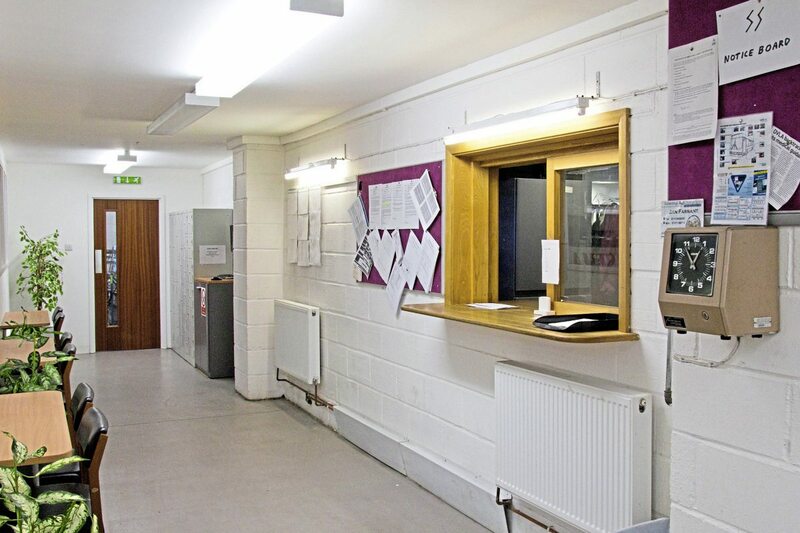 This had required investment in a new training facility within the office accommodation and the development of a programme delivering benefits to both the driver and the company. Core to the management of workload is the use of software from Distinctive Systems that is upgraded regularly to stay at the forefront of operations. 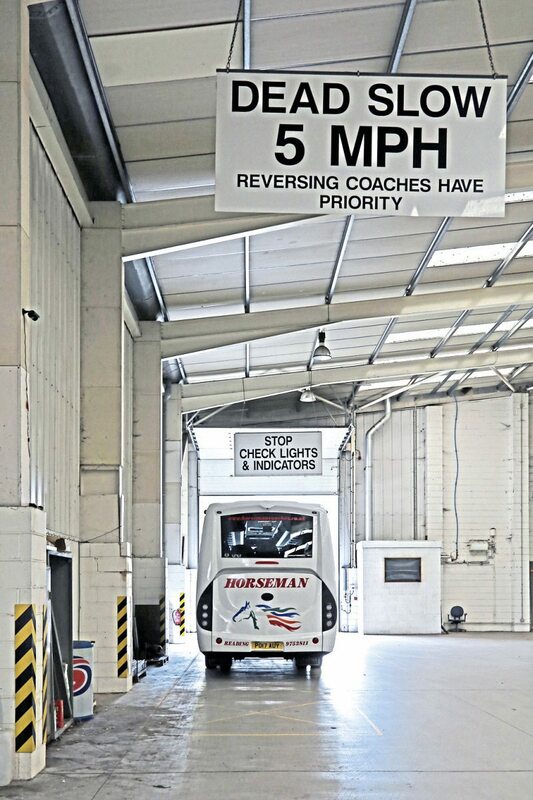 The recently introduced driver walk-round check from Distinctive Systems has been trialled, found to be satisfactory and integrated into the company’s procedures. An additional aid to drivers in checking their vehicles has been installed at the depot exit. A 60-inch TV screen displays the output from a camera focussed on the rear of the vehicle, providing for an additional check of rear lights each time the vehicle leaves the depot. Vehicles are monitored through the Fleetmatics REVEAL system with real-time tracking and a wide range of analysis available. Particular attention is given to vehicle idling where the bar is set at no more than 45 minutes per vehicle/driver per day excluding traffic-related stops. There is considerable rivalry between drivers to achieve the lowest idling times, the current record being a total of four minutes in a month. To add to the impact, the fuel cost of idling is monetarised. 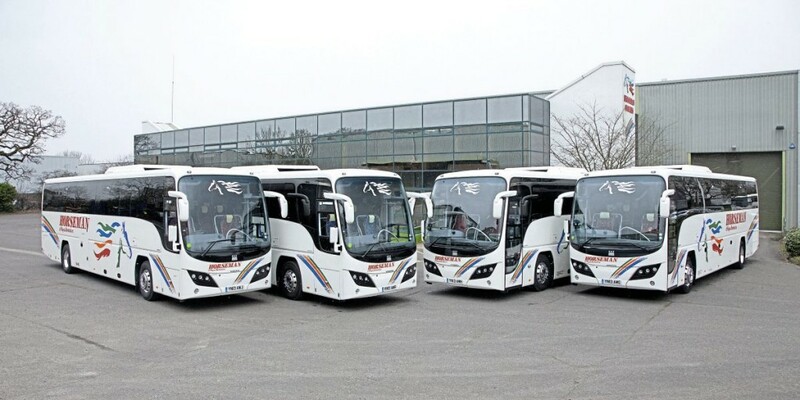 The company’s current operations call for 60 vehicles from the 67 currently owned, a number of Caetano Optimos being withdrawn for sale following the recent delivery of new Mercedes-Benz Sprinters. James advised that the target is to have a fleet no more than ten years old and this has recently been achieved, with the oldest operational vehicle now being a 57 plate. Running a young fleet has compensations: “It keeps the operation smooth and reduces the possibility of inconvenience to customers,” he says. 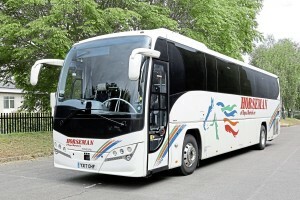 Since the mid-1990s, the Plaxton-Volvo combination has been the choice for full-sized coaches, following the model range from the Excalibur on B10M to the latest Panther Execs on B8R. 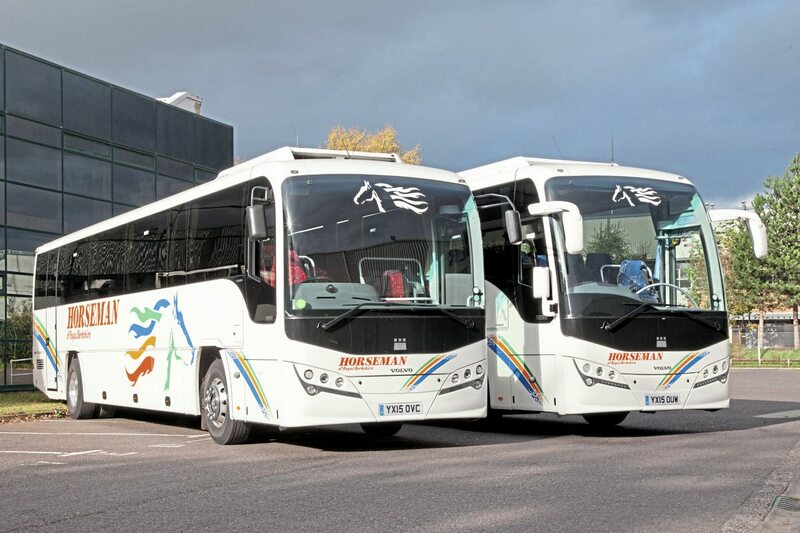 There are 32 examples of the combination, bought new over the past five years, and the vast majority 53-seaters with a variety of body styles – Panther, Elite and Leopard – offering a range of features for customers. Standardising on 53 seats provides effective flexibility although there are three 70-seaters for a specific school service. Alongside the remaining Optimos, there are a number of 33-seat Mercedes-Benz Vario-based Plaxton Cheetahs. These are essential for a number of contracts where bridge sizes and weight limits preclude anything larger. Following a non-blameworthy accident, the company’s insurers were looking to write off one of the last Cheetahs to be delivered but, as testament to how well it was built, James was able to persuade Plaxton to rebuild the vehicle at less than the write-off price. Although considering it a good vehicle in its own right, James has had to rule out Plaxton’s latest Cheetah, the XL, as being too large for the contracts he needs midi-sized vehicles to cover. Eleven vehicles have been added to the fleet in 2017, to bring the total of Euro 6 vehicles operated to 13. The first Euro 6 vehicles were examples of the Volvo B8R with Plaxton Leopard and Panther Exec bodies in 2016. 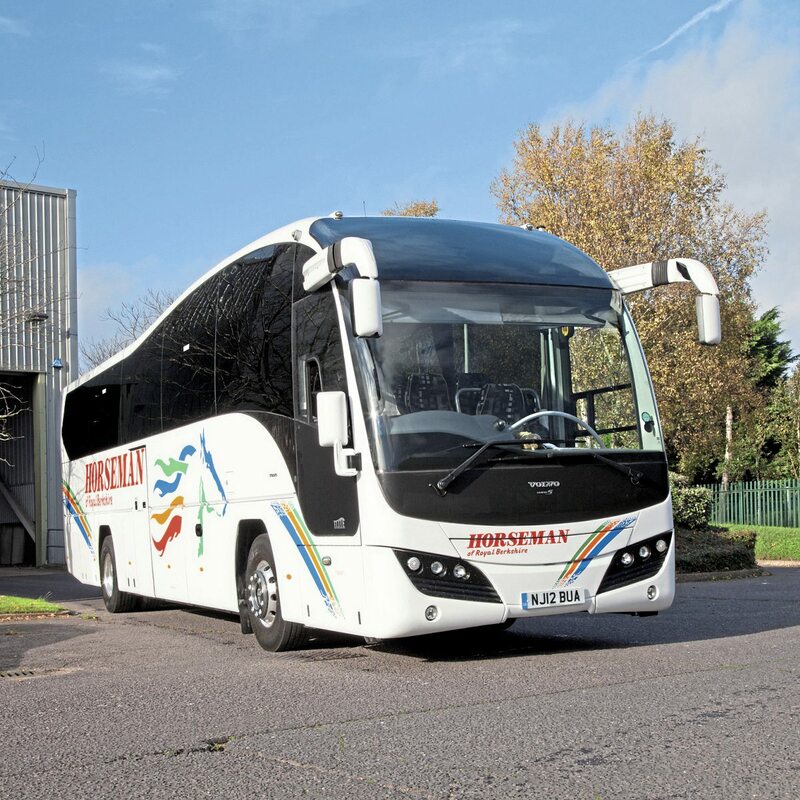 This year, Plaxton Coach Sales has supplied a further five 12.8m Panther Exec bodied Volvo B8Rs with 53 seats, parallel-lift lockers, servery, fridge, toilet, a sophisticated entertainment system and an eight-camera CCTV system. 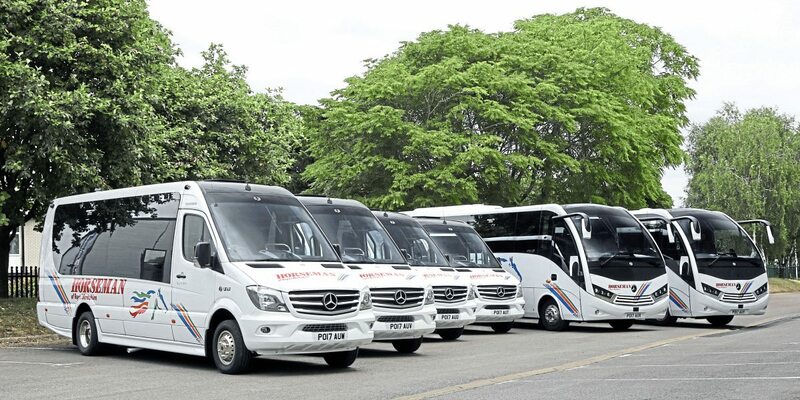 Six smaller vehicles from Unvi, on Mercedes-Benz basis and supplied by Taylor Coach Sales, complete the 2017 investment. Two are Atego 1023L-based Voyager GTs with 33 Brusa seats trimmed in half leather, Hispacold air conditioning and a Bosch entertainment system. They have 230bhp/172kw OM934 engines coupled to Powershift3 six-speed automatic transmission. The other four introduce the Sprinter 516-based Vega Ex to the fleet, offering 22 cloth-trimmed Prix seats, Diavia air conditioning and the Mercedes-Benz Audio 15 entertainment system. They have a 163bhp/120kW engine coupled to the 7G automated gearbox. Looking to future investment, James said: “We are gearing up to meet the needs of the ULEZ and will be looking to have around 30 vehicles at Euro 6 standard in the fleet by 2019. We do not need 30 in London everyday but we need the flexibility. It’s not just about compliance either, we understand the ethos of Euro 6 and if a company can reduce its carbon footprint, why wouldn’t they do it? The way Horseman Coaches started back in 1977 will be recognised by many coach operators around the UK. Keith and Annie Horseman saw an opportunity to operate coaches. They also ran a company, ‘Towrite,’ building trailers and fitting towing brackets to vehicles. Both Keith and Annie drove, as well as working in the office. 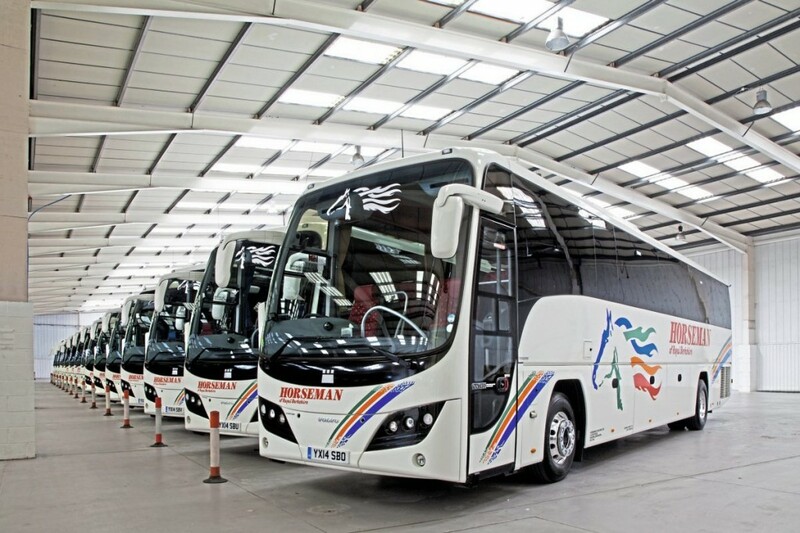 Full-sized vehicles soon followed and the family’s growing passion for the coach operation saw the primary business sold to concentrate on building up a successful coach business. 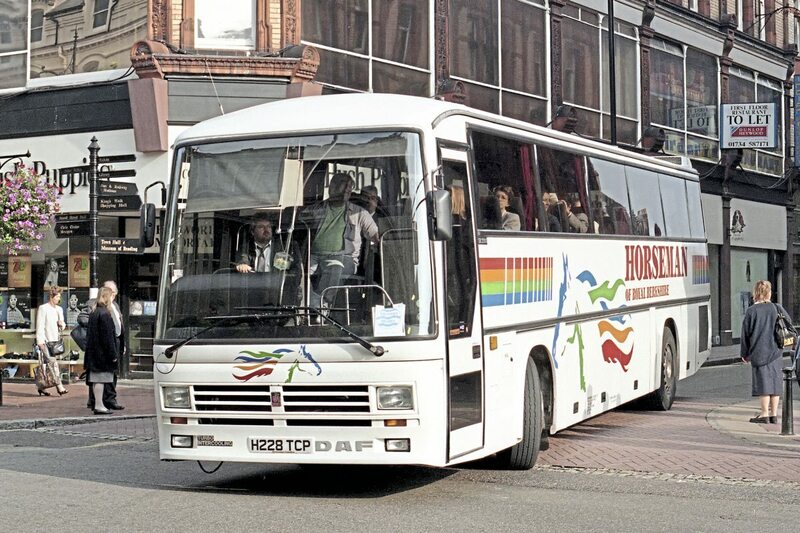 Reaching around 30 vehicles by the early 1980s, the 1984 acquisition of the long-established Smiths of Reading operation made Horseman Coaches the largest privately-owned operator in the surrounding area. 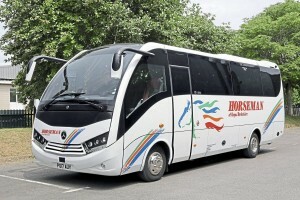 The 1990s saw further expansion with the establishment of the coach holiday company Horseman Travel, the provision of tour buses for the music industry and the introduction of operations around Heathrow. DAF was the preferred supplier of coach chassis into the 1990s with a variety of coachwork including examples of the Plaxton Paramount 4000 double-decker. For operations requiring smaller vehicles and some of the Heathrow work, a long association was developed with the Toyota Coaster-based Caetano Optimo, later examples of which are only just leaving the fleet. 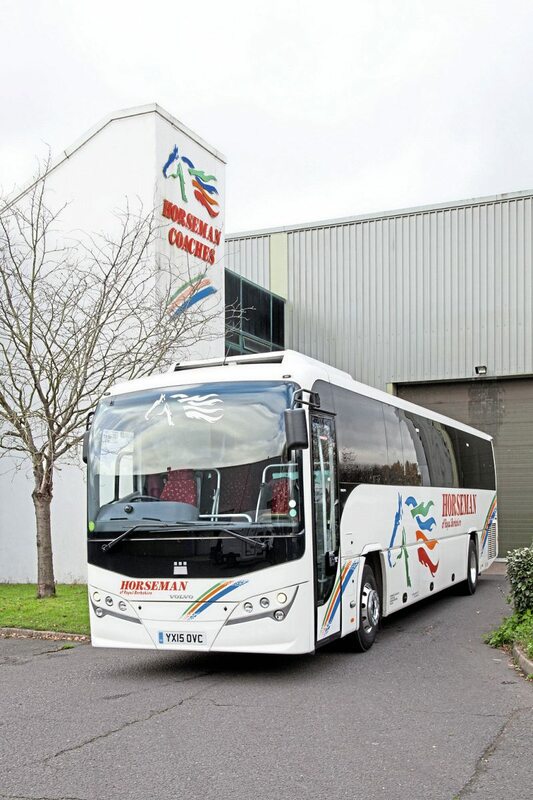 After reaching a peak fleet size of 125 vehicles in 1994 and winning the ‘Coach Operator of the Year’ title, the first years of the new Millennium brought a refocus of the business’ core activities, bringing schools’ transport to the fore. A major challenge was faced in 2008 when the company was given a compulsory purchase order on its then premises for improvements to junction 11 of the M4. The 42-day challenge was met by recognising the potential of a redundant Panasonic factory to offer fully under-cover accommodation.